Of course, hunting animals comes with weapons. here is what you can use. I persoanlly recommend the Cacciatore 12G and Strecker SxS, along with the caller. 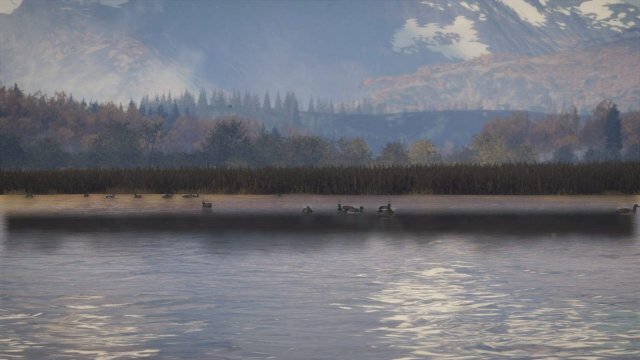 Decoys are optional if you have the dlc, with the ground blind and the shotgun. Getting started on your tracking quest is fairly easy, especially for new players. This guide is intended for both new players and old experienced players who are new to geese. 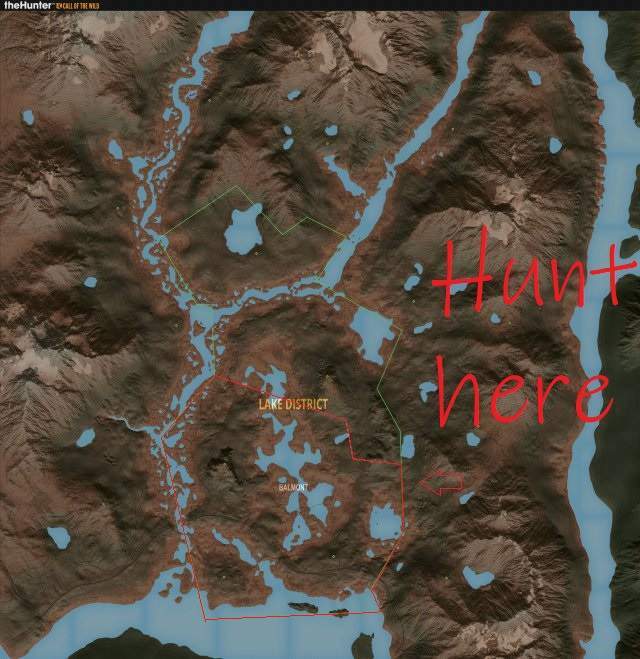 We will begin with where to hunt them. Personally, I have not hunted anywhere else for ducks besides Balmont. I never need to because there are ducks literally in every single lake here in this area. But, that is just me. You can always check other areas for ducks. I find the best time to hunt them smack dab at 11-12 AM in the morning. If you do not spot any ducks in the first lake, do not fear, keep searching through bodies of water, look for tracks and need zones, and listen for them. it should not take long for you to come across a duck or two, whether it be in the air, or in the water. There are many different steps you can take. Let's start with in the water. 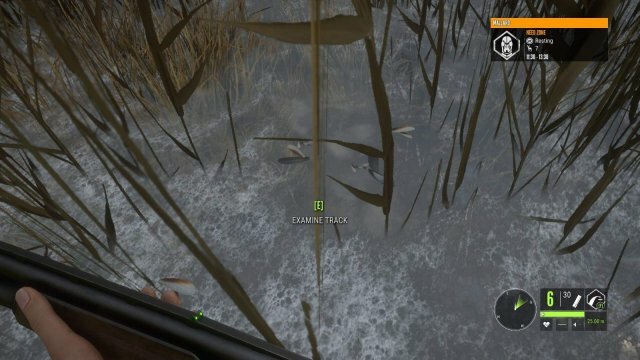 If you are an owner of the Jackrabbit DLC, you will have access to the .22LR, this gun is phenomenal when hunting ducks. You can sit back and blast them without having to get your feet wet! And thus, we move to tracking your duck. Tracking your duck can begin in many ways, you can simply look out into a lake a spot a whole flock of ducks eating, or you might not be so lucky, and they might not show up. There are steps you can take to track them like you would any other animal. This is a duck need zone. This pile of feathers can be a rest zone or a feeding zone. Drinking zones are not findable by the player, as they are in the middle of the lake you are going to be hunting them. 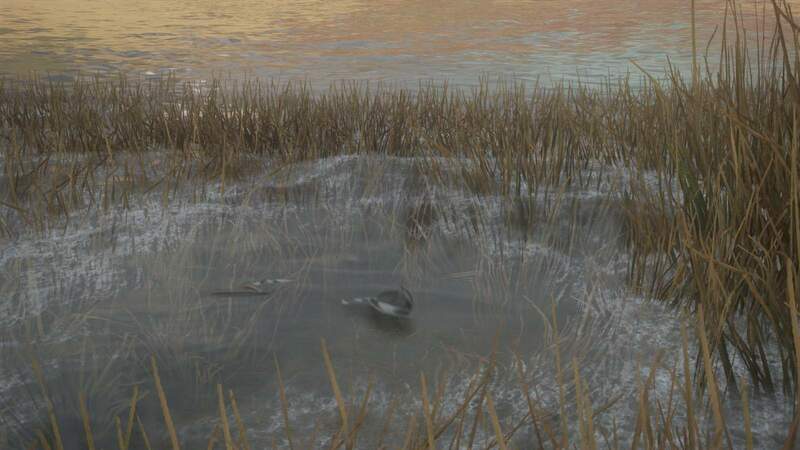 There can also be droppings, but they are always in the water and i cannot get a screenshot. When tracking a duck around a water source, try not to run around too much as they can see you visibly or hear you and spook. Always listen for ducks too, they may be overhead, and hear other ducks on the ground and land on their own, you can always call too. You can see that ducks can rest in the tall grass, they are silent this time, so you have to be careful not to spook them. During feeding or drinking time, they are loud as ever and they make a lot of noise, use this to your advantage. Look at how many ducks there are. They are eating at 11 AM in the morning, which is my hotspot for ducks. Unless you aren't picky, I would recommend looking for the biggest trophy, might be a diamond in there! And if there is none, just pick any you like. If they are eating or drinking, they will be in the deep part of the lake. 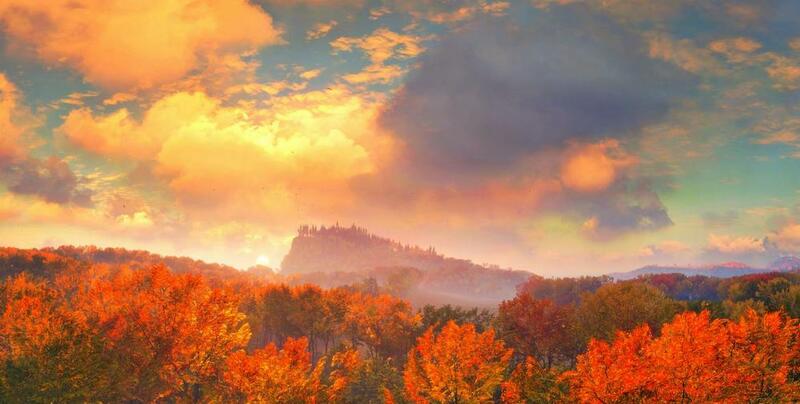 If you are resting, they could be in the center or in the tall grass. Pick your shot carefully. 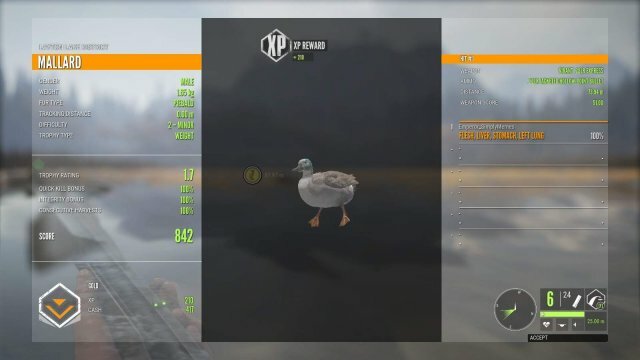 You can basically shoot a duck anywhere in the main body to kill them. Just don't shoot the feet or lower body. 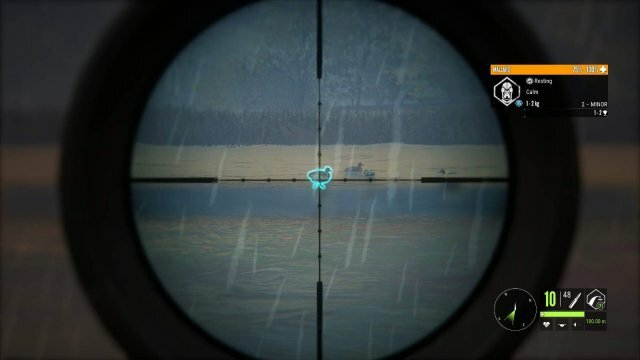 When you shoot one, they will all spook and fly int he opposite direction you shot, you can try to shoot them with a shotgun, but this will not be affective unless you're lucky. If they ducks fly high enough, they will despawn, so pick off as many as you can. Like this Piebald duck here, it can be worth the effort to look for special ducks, look for differences in the ducks, keep in mind that males have green on their heads and the females do not. Fur Differences are VERY HARD to spot in ducks, obvserve the ducks to find them. If you shoot a duck in the water, there is no need to worry about swimming to collect it. It will float to you automatically, or float to the ground. Although this feature is a bit buggy and sometimes they float to you, then float away in the middle of the water, going to the other side of the lake. 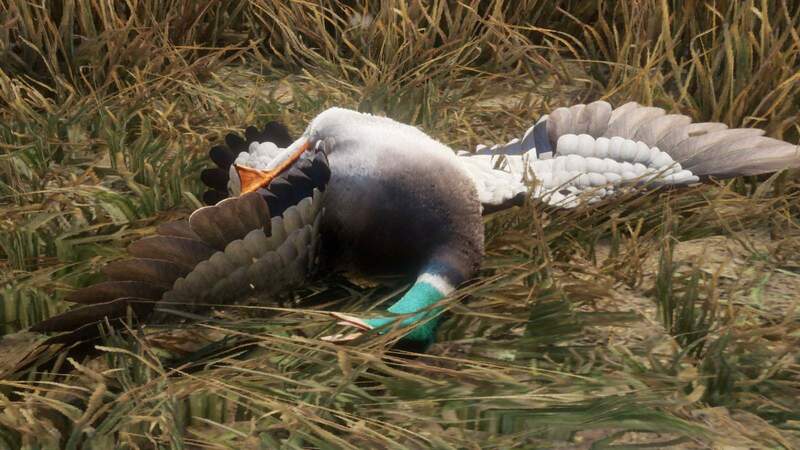 Unlike Geese, Ducks can be shot in the air without landing. You can use any gun for this, but try to get integrity, it will be worth it.